Pastor Joe joined Rochester Life in June 2018. He was credentialed with the Assemblies of God in 1995 and was ordained in 2009. Joe and his wife, Donneta, met at Christ For the Nations Institute in Dallas, TX and following graduation were married in 1996. 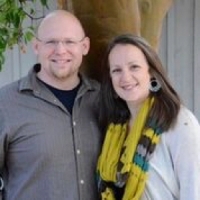 They served as youth pastors in Ferndale, WA, Lodi, CA and spent most of their youth ministry days at Meadowbrook Community Church in Champaign, IL. They served on staff there for 15 years. In 2015, they moved to Bellingham, WA and led a church planting effort called Four19 Church. Donneta served as worship leader at Meadowbrook Community Church for 15 years as well as the 3 years for Four19 Church. Joe and Donneta have enjoyed a partnership in ministry, leading worship services, mission trips, marriage counselling, supporting missionaries, mentoring young people and hosting meals in their home. The Barths have four children (Luke, Kolton, Alli and Simon). As a family, they enjoy camping, fishing, baseball and board games.